The Cargolux project in Zhengzhou, China, moves forward but under a different name as formerly announced: the new freight carrier will bear the name of Henan Cargo Airlines instead of Cargolux China. Cargolux will be responsible for the newcomer’s global sales activities. Today (June 12), the new carrier was put on track through the formal signing of the Joint Venture Equity Contract aimed at setting up a cargo airline in Zhengzhou. The long forecasted project followed a period of discussions, market studies and route evaluations, leading to a delay of the initiative. Also, external factors played a major role in the postponement of the plans such as the change of China's foreign investment rules or anti-corruption initiatives kicked off by Beijing’s rulers. Now, however, all obstacles seem to be have been set aside as shown by the signing of the agreement in the famous Great Hall of the People in Beijing. The ceremony was attended by political hons from both sides: China’s Premier of the State Council Li Keqiang and Prime Minister Xavier Bettel of Luxembourg. According to a release, the Henan Airport Group (HNCA) and the Xinggang Investment Group Company, which represents the Zhengzhou Airport Economic Zone, will jointly hold 75% of the shares in the new cargo carrier. Cargolux will hold the remaining 25%. Originally, CV was supposed possessing 35 percent capital stake in the Chinese joint venture. Obviously, Chinese rules on foreign participations have changed lately. The upcoming carrier will operate under Chinese AOC and be named Henan Cargo Airlines. This naming comes as surprise to observers because from the first moment the plans were made public in 2014 until now all sides spoke always of Cargolux China when touching on this matter. Both partners assure that the first revenue flight is planned for the fourth quarter of 2018. However, there are still many unresolved questions concerning the project. Here are a few: Will the newcomer operate Boeing 747-400Fs, and if so, how many? Do the stakeholders invest in new equipment or prefer leasing options. Further, which will be the initial routes to be served? And finally, has it been decided who will take the CEO position? No word to this in today’s Cargolux announcement. Arriving from Amsterdam, a Triple Seven freighter of Emirates Sky Cargo landed today (Monday) at 1:25 pm local time at LUX Findel airport. The flight underscores the partnership greement signed between CV and EK SkyCargo at the Munich-held trade show Air Cargo Europe last May (CargoForwarder Global reported). Consignments from both Emirates SkyCargo and Cargolux will be handled at Luxair Cargo at Findel Airport. 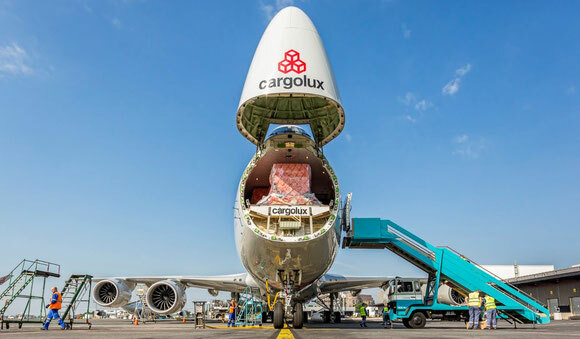 Conversely, Cargolux plans to up the frequency of their own freighters to Dubai World Central (DWC) from currently thrice weekly to facilitate connectivity between the two cargo gateways.